Even though “Mars Mantra” may strike you as a classic heavy metal introductory track, believe me – this album is thrash metal all over. Not pure thrash metal, as Kreator have realized long ago that a bit of technique and a handful of melody don’t make your sound less aggressive or less powerful. So you find elaborated guitar pieces with the destructive force of thrash but, simultaneously, the pleasant chords of melodic death metal. The band’s been trying this formula for about 4 albums now, but I dare saying that this is the best outcome so far. The title-track and “Death To The World” are the most straight-forward thrash metal tracks, while “United In Hate” follows that path after an acoustic guitar leaves you wondering for about 40 seconds. “Civilization Collapse” has its massive moments, but the groundwork is clearly drawn from NWOBHM. The same with “From Flood Into Fire”, but the latter in a more melodic way. Also “Your Heaven, My Hell” starts off slower than usual, Speesy giving an ominous tone with his bass, Mille Petrozza using his clean voice, before the music explodes along with a scream, Kreator-style. And “The Few, The Proud, The Broken” has some… “different” tempovariations, as the ones we can find in those experimental bands, so popular nowadays. So Kreator are trying to keep up with times. And if that didn’t work out very well for them in the nineties, I think now they’re making it. “Phantom Antichrist” is their 13th studio album – indeed a lucky number. 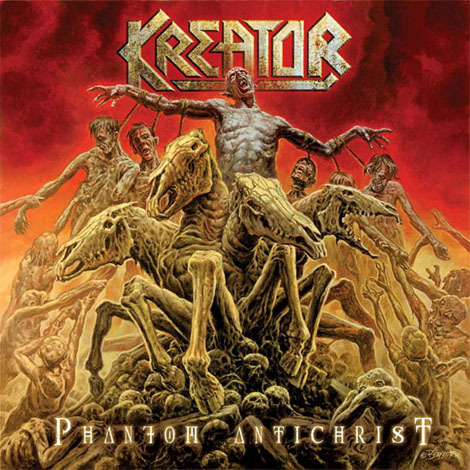 This entry was posted in CD reviews and tagged German thrash, Kreator, metal, Nuclear Blast, Phantom Antichrist, thrash. Bookmark the permalink.